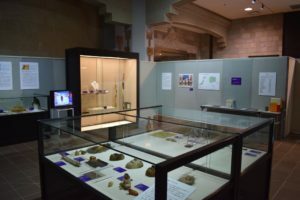 Jujiro Wada is currently being exhibited at Hokkaido Museum of Northern People from July 10 to October 10, 2018. 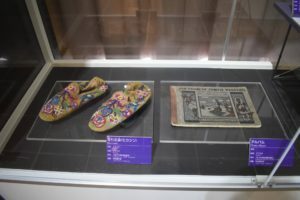 The 33rd Special Exhibition “North to the Future, History of Japanese Contact with Alaska” has been held at the Hokkaido Museum of Northan Peoples, the organizer of the Symposium. Curator Mr. Noguchi showed us around the exhibits. He came to Ehime to borrow some stuffs of Jujiro Wada, when representative of Jujiro Wada Memorial Association, Mikio Ueoka took care of him. That made Ueoka and Noriko Kan come visit Abashiri, Hokkaido. 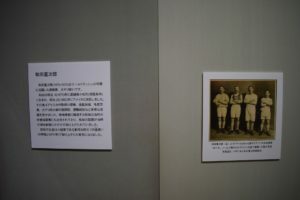 There was a Jujiro section in which his mini video has been shown. Another curator Ms. Sasakura introduced them at the reception. Previous: An annual event that honors Jujiro Wada and his legacy was held in Matsuyama. Next: Talk show in which women discuss 3 historical figures from Ehime prefecture.